Written by Dezza 4 January 2018. Our third Deztiki tour for 2016 was in November. There was quite a large gap between this tour and the last tour to Siniloan Laguna, which was back in March. This time, we decided to check out some Rizal Province Tourist Spots on our quest to find more of the best places in the Philippines. When planning day trips from Manila, it is important to take the time of year and the weather into consideration. The wet season generally begins in the Philippines around May and usually is finished by November. When it comes to visiting waterfalls, the best time of the year is usually December or January. At this time of year, the water flow is still fairly strong from the wet season. It was for this reason that we decided to take a casual day and visit Palo Alto Falls and Hinulugang Taktak in November. For this Deztiki tour we had 17 people, so we hired a comfortable minibus. 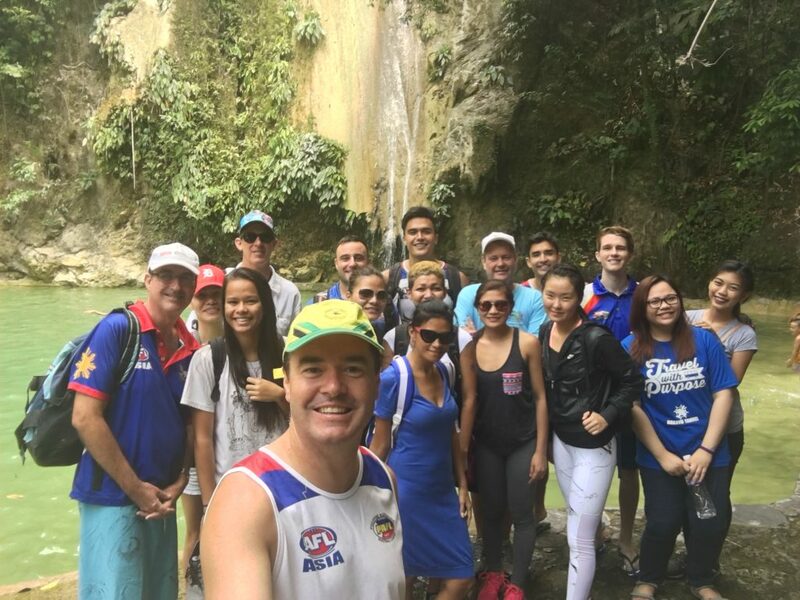 We started the day trip with a visit to Palo Alto Falls, which is in a place called Baras Rizal. Palo Alto Falls are actually located in the Palo Alto Leisure and Residential Estates, which is a 200 hectare prime residential and commercial estate. This was actually my 3rd visit to Palo Alto Falls. It is a nice place to spend an afternoon relaxing with a picnic lunch without a strenuous hike involved. This is one of the more unique Philippines destinations compared to other Rizal Province tourist spots. As mentioned, it is in a residential and commercial estate. The grounds are beautifully landscaped and have been well thought out, making it a safe and easy place to visit and enjoy. The developers have built around the natural waterways preserving as much of the natural landscape as possible. It reminded me a lot of Hidden Valley Springs which we visited back in April 2016. This is one of the reasons why I thought we would visit this place as part of a Deztiki tour as it is a relaxing way to chill out for a few hours. Palo Alto Falls is still a relatively new part of the Palo Alto Leisure and Residential Estates development. Therefore, it isn’t really a well-known place for locals, let alone foreigners. As a result, it doesn’t have that real touristy feel about it, unlike other Rizal Province tourist spots. In a way, you feel like you’re in a giant backyard! From the parking area, there are 249 concrete steps to get to the actual foot of Palo Alto Falls, which is 300 metres up. However, don’t be alarmed as the path is fully concreted/paved and the walk only takes about 10-15 minutes. 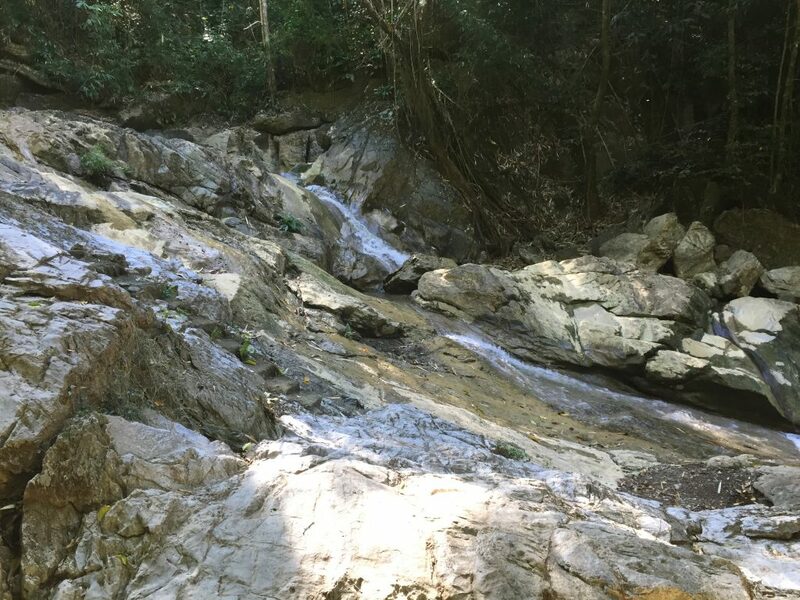 Along the way, you walk through thick forests split by a small stream, with water gently trickling down through the rocks. The peaceful rapids that run downstream and greet you just about as soon you start the walk to the falls. The waterfall itself is a natural waterfall. As part of the landscaping effort, the rock pool into which the water cascades has been paved. This makes it so much easier to walk around in, which is great for bare feet! The water is very clean and refreshing. It is like you are in a swimming pool that has its own 15 metre high waterfall flowing into it. 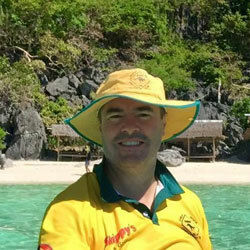 There are also a number of cabanas (cottages) around the rock pool that are available for hire. These cost P700 for half a day. However, there are also a number of retaining walls which double as seating. You can also hire some plastic table and chairs in the shade for P300. There are showers and toilets there also, although they are not very well maintained. They are still more than adequate for what is required. Pre-departure photo before heading back to Antipolo City. After having a picnic lunch and spending an hour or so swimming, we still had plenty of time up our sleeve. I suggested that we go to Hinulugang Taktak which is a national park in Antipolo City. Antipolo is the largest city in the Calabarzon region and the seventh most populous city in the Philippines. Antipolo has a rich history with Franciscan missionaries arriving in Antipolo in 1578. Located in the Sierra Madre Mountain Range, much of the city sits on a plateau averaging 200 meters above sea level. Therefore, Antipolo weather can affect your planning. However, the altitude offers you sensational views back towards Metro Manila. As a result of the mountainous terrain, there are a number of waterfalls, rivers, caves, forests and other natural attractions in the area. Hinulugang Taktak is one of these popular Rizal Province tourist spots and it is easy enough to get to from Palo Alto Falls. The waterfall at Hinulugang Taktak is more spectacular than Palo Alto Falls however, you can’t swim there. Hinulugang Taktak has a beautiful waterfall that is about 20 meters high and has quite a wide face on it. You will find a number of walking paths and look out areas, so it is a great place for a casual stroll rather than a strenuous hike. There are also cottages scattered around in which you can have a picnic lunch and chillax. There is also a large swimming pool which is a very popular attraction with the locals. This is even more so as you cannot swim in the waterfall at Hinulugang Taktak because unfortunately, the quality of the water is quite poor. There is also a small eco-farm there which you can also visit. The swimming pool was closed for maintenance when we were there but on other occasions I have been there, it is packed with people. As we had already had our lunch at Palo Alto Falls and had done some swimming, we only spent about one hour at Hinulugang Taktak. This was enough for us to have a casual stroll around the place and take a few photos. Then it was time to board a minibus for our drive back to Manila with a few customary beers for us to enjoy along the way. This was a very relaxing day enjoyed by all. Google Maps: Palo Alto Falls, Hinulugang Taktak. 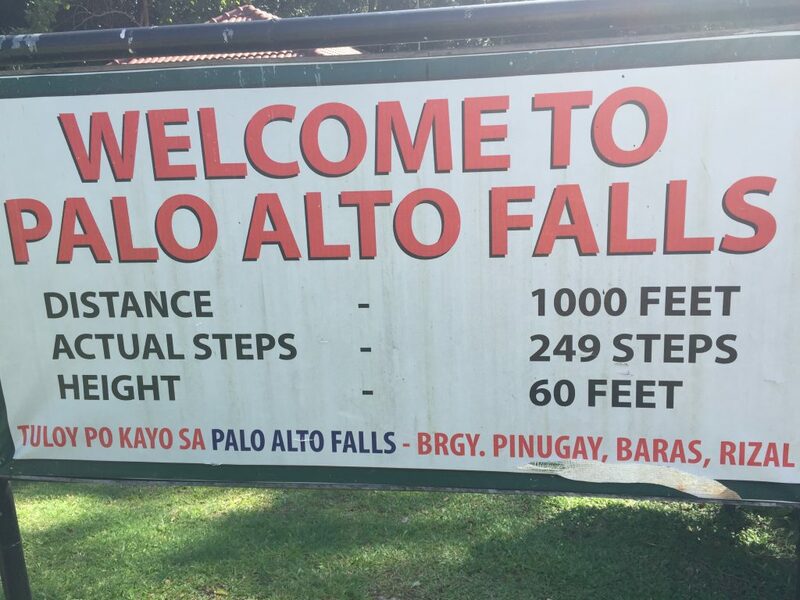 Costs: Palo Alto Falls entrance fee is P100 (free if not swimming). Alcohol is prohibited. Avoid going there during the summer months (March to May) as the stream that feeds Palo Alto Falls has a low volume of water, so the waterfall is barely a trickle. 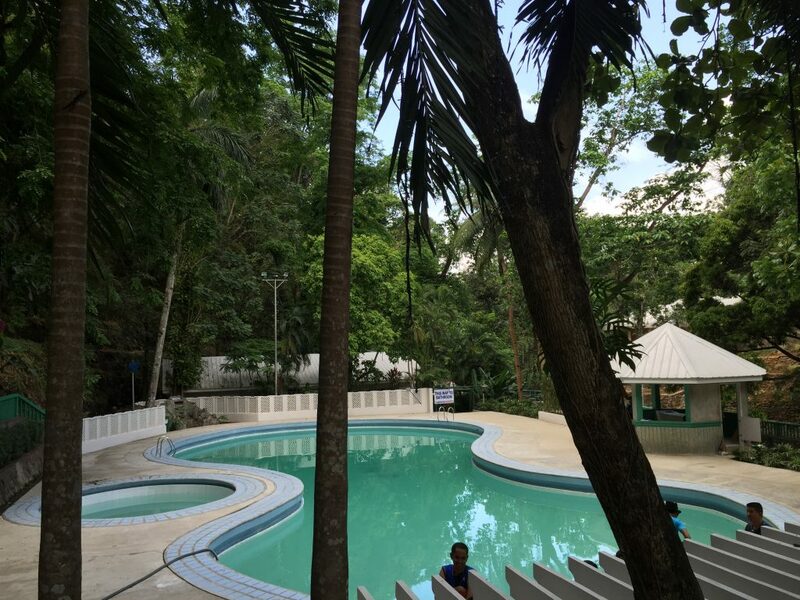 Hinulugang Taktak has free entry and the cottages are all side free of charge. However, you must register and they accept donations if you’re feeling generous. There is a kiosk there offering a variety of snacks and drinks. Things to do: There are a number of things to do in Antipolo. Depending on how much time you have, a trip to Palo Alto Falls and Hinulugang Taktak is easy to do in one day. 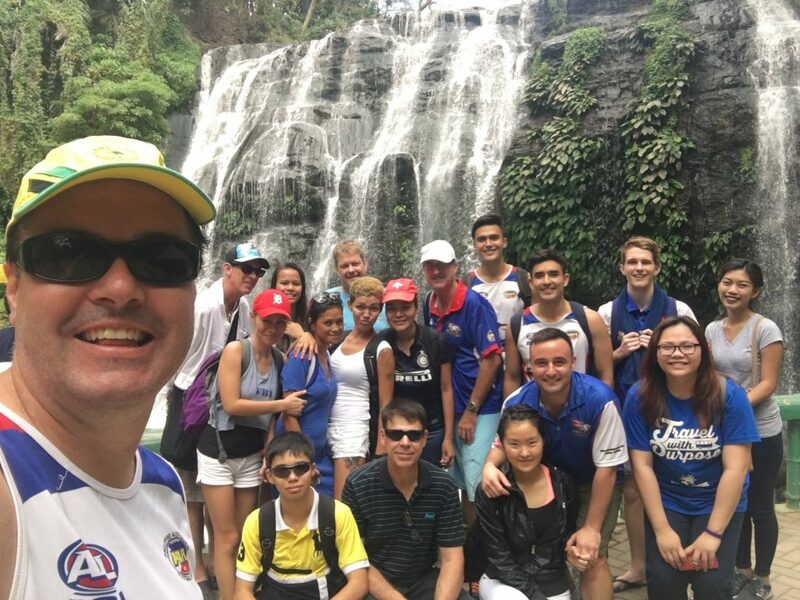 Palo Alto Falls is only about a one and a half hour drive from Manila. From there, the drive to Hinulugang Taktak will take you about 30 minutes. If you are feeling more adventurous, see videos below for some more ideas. Directions and Transport: To get to Baras Rizal from Makati by car, head out along the Marcos Highway. There is a gate and a big banner indicating the entrance to Palo Alto Falls and Leisure Estate on the right-hand side. Enter there and continue for a couple of minutes. On your left, you will see the car park and kiosk. You can find this on Waze or Google maps. There are no buses running directly to Baras but from Antipolo, there are jeepneys available that are bound for Tanay in Rizal. These pass by the gate of the Palo Alto Falls and Leisure Estate. This would probably take 2.5 hours and cost no more than P200. Jam Liner bus service runs from the Buendia Terminal bound for Antipolo on a regular basis with the fare less than P150. Travel time is about 1.5 hours. If you’re driving from Baras to Hinulugang Taktak, you can find this easily on Waze or Google Maps. Use Casa Santa Museum or Antipolo City Hall as your reference points. This also applies if travelling by jeepney. You can take a jeepney from Antipolo City Hall to Hinulugang Taktak.